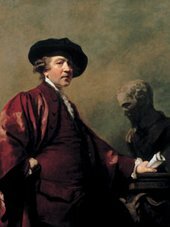 Joshua Reynolds was fascinated by his image: by the persona he projected to the outside world and, quite literally, by his own face. He produced about thirty self-portrait paintings and drawings over half a century. These reflect, above all, the influence of Rembrandt. At times, like Rembrandt, Reynolds would use himself as a model to explore facial expression. But on the whole Reynolds’s self-portraits reflected his public persona, his social status and ambitions as an artist and intellectual. And unlike Rembrandt, who used the self-portrait to convey emotions, Reynolds never dropped the mask. The portraits in this room were part of a calculated public relations exercise. Each represents a key moment in Reynolds’s public life. The earliest was painted when he was in his mid-twenties, advertising his skills when he was an up-andcoming artist in London. Others show him studying in Italy, and as president of the Royal Academy. In later self-portraits Reynolds admits to physical infirmities, but while his glasses show his failing sight, they also confirm his intellectual powers and his status as a man of vision. Reynolds probably painted this self-portrait when he was about twenty-four, just before he set out for Italy. It is one of the most creative responses to the art of Rembrandt produced in eighteenth-century Europe. At the same time it is a manifesto of the young artist’s aims and ambitions. Reynolds is casting himself in the role of a man of vision, who uses the art of the past in order to look to the future. His appearance at first sight impressed the SPECTATOR with the idea of a well-born and well-bred ENGLISH GENTLEMAN. This painting, one of the most exciting Reynolds discoveries of recent years, was only identified as a Reynolds self-portrait in 2001. It was probably made in Rome, when Reynolds was about twenty-seven. 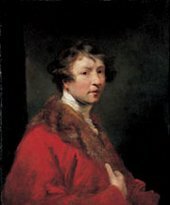 It may be the picture that one of Reynolds’s pupils saw in Rome in the 1770s; he said this was ‘painted by [Reynolds] when in his studies in that city, and left by him in the house where he lodged at that time’. This unfinished work is one of the most Italianate of Reynolds’s self-portraits. Reynolds is in his early to mid thirties, wearing the sort of exotic outer garment often adopted by Europeans making the Grand Tour. 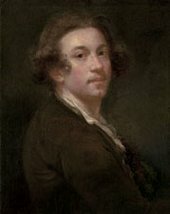 Reynolds probably painted this self-portrait to celebrate the move of the Royal Academy to prestigious new premises at Somerset House. It may have hung in the assembly room, alongside a portrait of the Academy’s treasurer and architect of Somerset House, William Chambers. 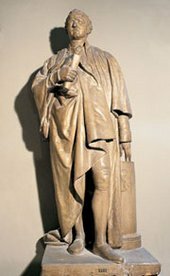 Reynolds wears his doctoral cap and robes, and holds a scroll referring to his Discourses on Art. The bust of his artistic hero, Michelangelo, seems to nod in deference towards him. 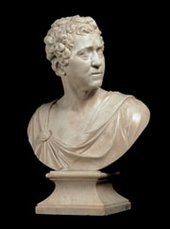 In this bust Ceracchi portrays Reynolds in the guise of a heroic classical figure. Modelled on antique busts of the Roman emperor Caracalla, this is a tribute to Reynolds’s status as a ‘philosopher’: an intellectual who thinks about, as well as practises, art. Ceracchi, who came to England from Rome in 1773, specialised in making busts of celebrated public figures, including Reynolds’s friends, Augustus Keppel and the Marquess of Granby. This is Flaxman’s model for his large marble statue of Reynolds, erected in 1813 in St Paul’s Cathedral, London, where the artist was buried. In his right hand his hold a volume of his Discourses on Art, while his left touches a pedestal with a relief sculpture of Michelangelo.